At MASCOT, you will find a selection of T-shirts with print for the ones who want their workwear to be a tad more edgy. T-shirts for work does not have to be neutral – therefore, you will find a selection of T-shirts with fashionable print at MASCOT, so you can make your workwear more personal. The T-shirts are also perfect for leisure. The cool T-shirts are usable on warm summer days or during the transitional periods together with, for example, a smart thermal jacket or sweatshirt. 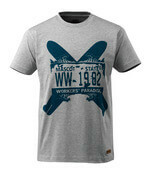 Within MASCOT® ADVANCED, the T-shirts with print are available in different styles and colour combinations. The colours are aligned with MASCOT's remaining assortment so you can easily mix and match the MASCOT T-shirts with print with the additional workwear from MASCOT. Common to all MASCOT T-shirts with print is that they are produced in 100% cotton. The cotton is moisture absorbing and very comfortable to wear against the skin. The MASCOT T-shirts with print are available in a modern fit that follows the body's natural shape without fitting too tightly. It gives you a really good comfort and freedom of movement throughout the day. In addition, all of the T-shirts have extra padding over the seams at the neck so they won’t bother you, when you are working. All of the MASCOT T-shirts with print are Oeko-Tex ® certified, which is your guarantee that the products do not contain harmful substances.